The obituary notices contain the name of Pte Ernest D Wilson who was killed in action March 22. The sad news was received by his mother Mrs Wilson of Sheldon Villa, Sheldon Road on Monday. 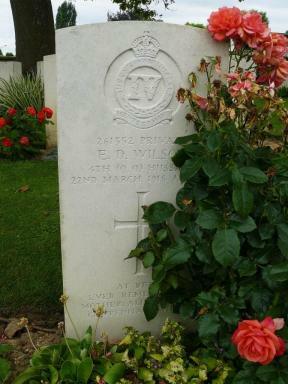 The deceased who served his apprenticeship at Saxby and Farmer's afterwards entered the aeroplane factory at Filton and when war broke out he was employed in an engineering establishment in London. Pte Wilson came from a patriotic family and his father is now serving with the Engineers. Young Wilson joined the RAMC and was successively transferred to the London Yeomanry and the Hussars and with the latter Regiment went to Ireland. IN March 1917 he proceeded with a draft of the regiment to France. Frances K Kidd Deeply mourned.